A female (L) and male (R) pigtailed macaque (Macaca nemestrina) housed at the Washington National Primate Research Center in Seattle, WA. Photo: Dennis Raines. The Special Issue (synopsis provided in the Introduction) is a compilation of review articles and empirical research articles from non-human primate experts that provide evidence-based information pertaining to social housing for laboratory primates and the utility of techniques to indicate chronic stress and related measures of well-being. With increased regulatory, accreditation, research, and public attention focusing on nonhuman primate well-being, the release of this issue is timely. The issue’s target audience includes those who hold scientific and/or management oversight of captive primate behavioral management programs, though it’s freely-available status provides a unique opportunity for the general public to become familiar with the types of research being conducted to improve the well-being of laboratory primates. 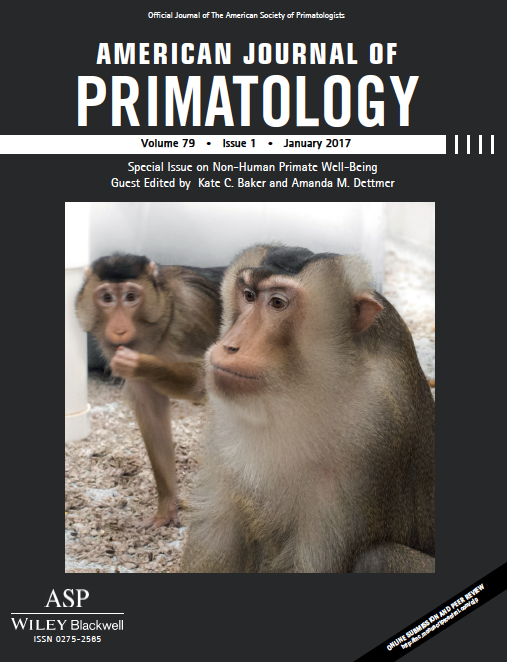 The Special Issue is conceptually comprised of two parts: Pair Housing in Laboratory Primates and Indices of Well-Being in Laboratory Primates. The Pair Housing section begins with two extensive review articles analyzing the scientific literature surrounding social housing introductions and maintenance of social housing in macaques, the most commonly-studied genus of captive non-human primate in the U.S. Included in the first of these articles (Truelove et al., 2017) is a set of recommendations from researchers at the Yerkes National Primate Research Center for many key issues involved in the management of macaques, such as partner selection, introduction, and special populations. The second review article by Hannibal et al. (2017) from the California National Primate Research Center “assists with harmonizing social management and research aims” (Baker & Dettmer, 2017) by highlighting the important fact that changes in the social environment can influence the physiological and physical health of captive non-human primates. Importantly, this article also takes into account how the change in social status may influence research goals. The remaining articles in the first section present empirical research in which controlled experimental manipulations were conducted to identify the ways in which pair introductions are influenced by species, demography, partner selection techniques, and early interactions. Notable experts in primate behavior provide these important contributions, including John Capitanio et al. (2017) from the California National Primate Research Center, Matthew Jorgenson et al. (2017) from Wake Forest University, Larry Williams et al. (2017) from the MD Anderson Cancer Center, and Julie Worlein et al. (2017) from the Washington National Primate Research Center in Seattle. 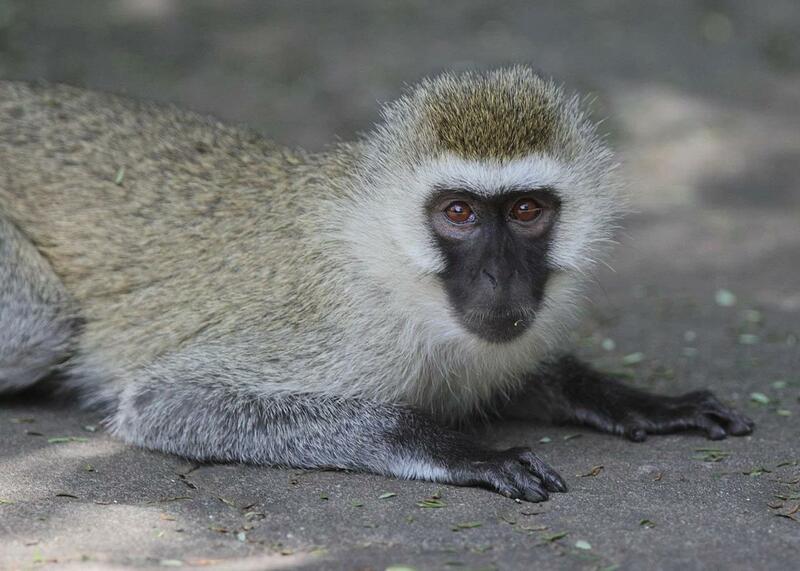 Vervet monkey (Chlorocebus aethiops sp.). Photo: Kathy West. The second part of the Special Issue on Indices of Well-Being in Laboratory Primates presents, for the first time, research on a long-term index of hypothalamic-pituitary-adrenal (HPA) axis activity: hair cortisol. Cortisol is a hormone associated with stress responsivity, and its measurement in hair is an established biomarker of chronic stress. In several empirical research articles in this section, hair cortisol concentrations (HCCs) are related to behavioral indices of well-being including alopecia (hair loss), anxious behavior, and self-injurious behavior (SIB). Importantly, many of the studies in this section rely on collaborations between several primate facilities across the U.S. The first three papers, by recognized experts in non-human primate well-being, describe risk factors and biomarkers for alopecia in rhesus monkeys. Melinda Novak et al. (2017) from the University of Massachusetts Amherst describe how relationships between alopecia and HCCs over an 8-month period are different for monkeys that regained their hair versus those that continued showing hair loss. Notably, these relationships were facility-specific. Related, Rose Kroeker at al. (2017) from the Washington National Primate Research Center describe how prior facility origin influences rates of alopecia in monkeys that are currently housed at the same facility. Of particular note is the fact that prior facility effects were evident 2 years after relocation. Amanda Dettmer et al. (2017) from the National Institutes of Health describe a unique risk factor for alopecia: pregnancy. They relate this particular risk factor to higher HCCs and differential maternal investment in the neonatal period. The following three articles provide novel information linking HCCs and behavioral indices of well-being across four facilities. Amanda Hamel et al. (2017) from the University of Massachusetts Amherst describe a cross-facility study showing how HCCs relate to responsivity on a well-established, reliable behavioral assay for non-human temperament and behavioral reactivity: the Human Intruder Test (HIT). Kristine Coleman et al. (2017) from the Oregon National Primate Research Center then describe how alopecia and temperament relate in monkeys housed in the same four facilities, importantly relying on a cage-side version of the HIT that minimized potential reactivity that may result from separation from the social partner. Emily Peterson et al. (2017) study the HIT in relation to SIB, providing new information between SIB and anxious temperament. 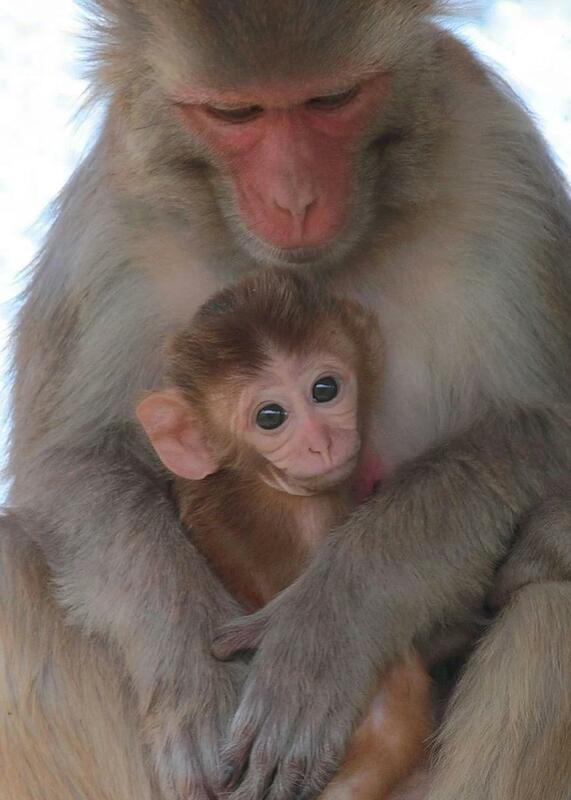 Rhesus monkey (Macaca mulatta) mother and infant. Photo: Kathy West. The Special Issue closes with a review by Allison Martin et al. (2017) from the Yerkes National Primate Research Center describing the utility of applying a behavioral analytic theoretical framework in studies of non-human primate well-being, with a special focus on the prevention and treatment of abnormal behaviors. This paper is unique in applying human clinical approaches to primatology, which represents a unique reversal of the translation of research methods. Collectively, this Special Issue represents a comprehensive, evidence-based collection of rigorous research studies and detailed reviews from recognized experts in primate behavior that serves to provide new, timely, and critical information that will ultimately improve the welfare of these valuable research animals. Funding agencies, professionals working with captive non-human primates, and the public alike should familiarize themselves with these studies, as they highlight the dedication of the research community to continually improving the everyday lives of the animals that contribute important advancements to human health and to general scientific knowledge. Posted on January 23, 2017 by EditorPosted in News, Outreach News, Science NewsTagged AJP, American Journal of Primatology, primate research, primate welfare, rhesus macaques, vervet monkeys. This is a fantastic idea. I look forward to reading this important issue! Awesome! This will be invaluable in a number of my classes. Thanks AJP Editors and contributors!